Want to grow a cashew tree in your garden? 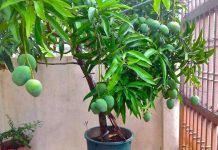 But for growing cashew nuts tree you’ll need to acquire some basic growing and planting information that is given below in this article. Cashew nuts growing is easy, but it requires a more specific environment and growing conditions. 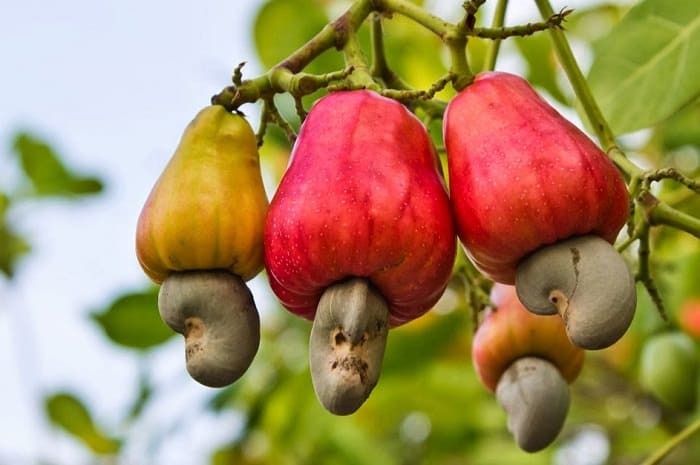 If you can provide that environment then you can grow your cashew tree and enjoy the nuts and fresh fruits that are called cashew apple, throughout the year. Cashew or Anacardium occidentale originates from the Caribbean Island and the North East of Brazil. But today it is grown in several other tropical parts of the world. Mostly in Africa, India and Southeast Asia for cashew nuts. It is also called as cashew apple tree; it is part of the Anacardiaceae family, the same family that belongs to pistachio and mango. Cashew tree can grow up to 6 – 12 m (20 – 40 f) high. Its evergreen leaves are oval, leathery and dark green. They have a prominent midrib. The flowers, white and pink are gathered in inflorescence at the tips of young shoots. They are smaller in size but very fragrant. As for the fruits of this tree, do not be fooled by appearances. The cashew apple is oval-shaped, like bell pepper: yellow, orange or red in color is a false fruit (it is also edible). The real fruit, more discreet is a nut attached to the end of the fake fruit. It is that which contains the edible kernel, which we called cashew. Cashew tree can be grown from seeds, air layering, and grafting. To propagate it from seeds, you will need a matured unshelled nut (seed). 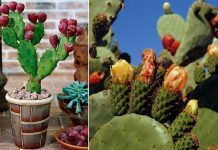 These seeds are viable up to 4 months. If you have collected the fresh seed from the tree, dry it in the sun for 3 days and soak in water overnight before sowing. Sow the seeds in good quality seed starting mix; the seeds will germinate anywhere from 4 days to 3 weeks. Cashew tree needs at least 6 hours of direct sun, it grows slowly and doesn’t fruit if grown in the shade. Cashew prefers poor sandy and laterite soil with the pH level around 5 – 6.5. Never grow cashew tree in a clay-rich soil. It is heavy and encourages waterlogging, and in the case of growing cashew tree, the soil you use should be well drained in a way that water will flow smoothly. Cashew trees are moderately drought tolerant once established, but they produce more fruits if watered regularly. During the summer, water weekly or twice and deeply. Reduce or withhold watering during winter. Overwatering can harm or even kill your cashew tree, so water only if soil is dry and let the soil to dry out between spells of watering. 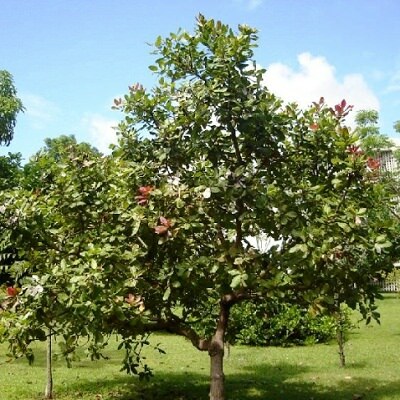 Cashew tree needs regular application of fertilizer to grow vigorously and produce fruits. Use slow release fertilizer with N-P-K 8 – 3 – 9 according to the product instructions given on the packet, around the base of the tree every two months during growing season. Also apply compost or farm manure once in a year, around 30 pounds (15 kg) on the surface of the soil to a mature tree. Prune cashew trees regularly to remove weak, dead and entangled branches and branches that are infested with diseases or pests. Also, cut overcrowded branches to promote vigorous growth. Do mulching around your cashew tree with organic matters to prevent weeds and to conserve moisture. The cashew tree is generally pest free if it is in good health. Major pests that attack it are tea mosquito, stem and root borer, leaf Miner and blossom Webber. Harvest when cashew apples turn pink or red and cashew nut shell are gray. After harvesting, separate the cashew apple from the nut. Cashew apple can be eaten raw or make juice of it. Unshelled cashew nut can be stored up to 2 years. Do not attempt to break the shell before roasting; cashew shell contains very caustic oil which can burn skin. When processing cashew nut at home must wear gloves and safety glasses and take special care. To learn more on how to process cashew– read this. Sow fresh cashew seeds for germination, as they germinate easily. 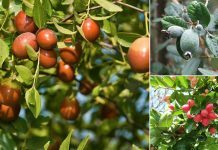 A tree grown from seeds take 3 to 5 years to produce its first fruits. Our recommendation is to buy a potted plant from a nursery, this way you’ll not have to wait that long. Choose a location that is well protected from the wind. Cashew grows better when the temperature remains around 80 degrees Fahrenheit (25 C) although it can withstand temperatures as low as 50 degrees Fahrenheit (10 C) and as high as 105 Fahrenheit (40.5 C) without any problem. Keep the area around the base of your cashew tree free from weeds, small shrubs, vines, and debris. Watch for sick or dead branches, prune them if necessary. One of the most delicious and healthiest nuts cashews are an amazing source of nutrients, and not only the cashew nuts but its fruit cashew apple is nutritious too. It is a rich source of vitamin C, five times more than an orange. It also contains higher amounts of calcium, iron and vitamin B1, which is more than most of the fruits. To know more about the benefits of cashew nuts read this article. Good info about cashew nuts growing. What distance to grow between tree to tree? I would like to know the distance between tree to tree while planting. Can you please let me know this info? please let me know the distance between tree to tree while cultivating..
ISNT THE CASHEW NUT POISONOUS UNTIL IT IS PROCESSED? Is there only 1 nut on each cashew apple??? Am planning on having a bee garden and I want to add cashew trees into the garden. But I need to know how many times cashew produces it fruit in a year? Is it a temperate,Tropical or sub tropical climate fruit, please know me. and which country is the rich producer of this, if possible please know me about its internationally export and import. I found this article very informative and useful. I have been growing Cashew in Sri Lanka for a very long time but I learnt something new reading this. I’m planning to grow Cashew more systematically now on my land in Koralegama in the Kurunegala District in the Dry Zone where Cashew grows well. Last year I planted some bud grafted plants and surprised to find the plants flowering now.